"I'm not flat!" Thats is the credo of 3Dbin team via using social servises in the Internet. This way might look your profile in Myspace today. Today, everyone can make their 3DPhoto and paste it into Myspace profile. Functionality of this service enables you to place 3DPhoto, also in your personal blog, comments or group description and discussions. 1. Go to the 3DBin.com and sing up for free. 3. Make your 3DPhoto as shown and share it. 4. 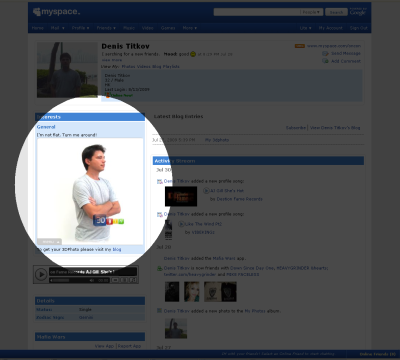 Copy and paste the HTML of your 3DPhoto into your MySpace profile. 3DBin team anounced that the widgets for MySpace and Facebook will be avaliable 2 weeks later.